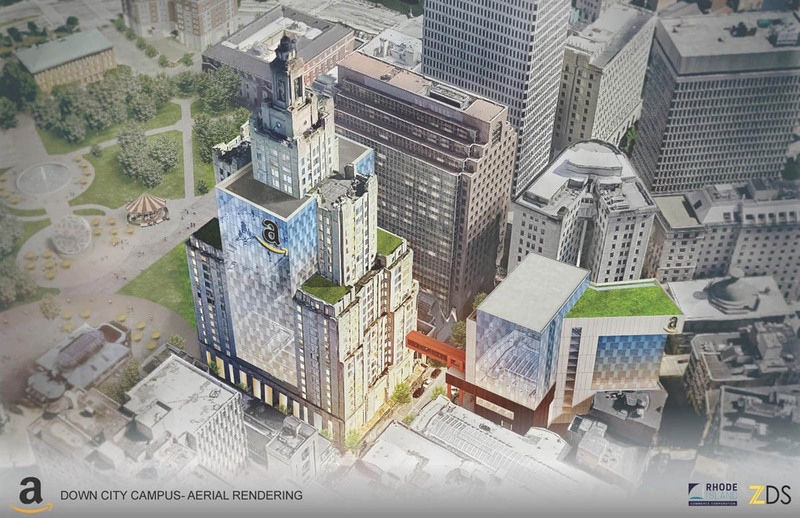 Rhode Island leaders hoped to deliver Amazon’s “HQ2” into downtown Providence’s vacant “Superman Building”. In response to a Providence Journal Access to Public Records Act complaint, the Rhode Island Commerce Corporation Thursday released a lightly-redacted copy of the state’s unsuccessful bid to land the e-commerce giant’s proposed $5-billion second headquarters, a pitch centered on Rhode Island’s tallest building. “Traditional roadway upgrades would be conducted and fully-integrated public transit options would be complemented by ambitious pilot programs and innovative infrastructure developments,” it said. Specifically, the state offered to build an autonomous bus network with dedicated lanes to serve Amazon’s new offices. The article goes on to state that among further infrastructure improvements, expanded Narragansett Bay ferry service was offered. I can see the temptation to throw all these things on the table to try to attract 50,000 new jobs, but where are the proposals to try to land 10,000 or 20,000 new jobs incrementally? Why aren’t we making higher speed commuter rail service to Boston and within state a priority? Why not expand ferry service now? What are we doing to create more housing for the workforce we hope to attract?